A wooden summer house can add a lot not only to your garden, but also to your lifestyle as a whole. It will be open to a wide variety of uses according to your present needs and preferences, and it will also be there in the future and you can count it in as a valuable asset for future evolutions of your interests, hobbies and personal style. So, would it be possible to build a wooden summer house from scratch on your own? The answer depends on your skills as a DIYer. For a novice woodworker it would probably be advisable to get detailed plans with an assembly manual first or – if you want to make the plans yourself – have them checked by a more experienced builder, who knows about the special requirements connected with constructing wooden buildings. Garden summer houses must be built according to the rules that are predetermined by timber as a building material. Any poor construction will become clearly visible as cracks, gaps or warped parts and you could be lucky, if these imperfections impair just the optics and maybe the tightness and not also the structural integrity of the summer house. What is to be gained by building a wooden summer house by yourself? On the other hand you will pay for the spared money with your working power and your time and the result will in most cases be individual, but it will probably also display the one or other beginner’s mistake. What kind (species) of timber can I use? How do I find well seasoned timber? How can I find timber with a good sturdiness? How do I select components that are cut expertly according to the specifications? What kind of proper timber joints to use at which parts of the construction. What is not yet mentioned here is that the construction plans, the thicknesses of the parts according to their role in the statics of the garden building will also depend on the sturdiness of the material and the timber-species chosen. 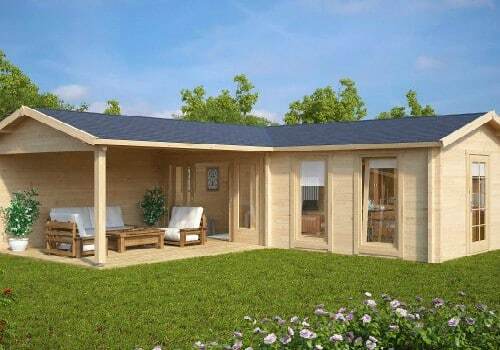 All these considerations are of course not necessary when purchasing a ready-built set for a wooden summer house from an experienced manufacturer. Through the warranty on their buildings these manufacturers stay connected with their summer houses, and if there are major problems with one of their constructions caused for example by the settling of the summer house due to the shrinking of the timber during the first years, such construction defects will be remedied quickly and taken into account for future buildings. However, the fun of working with wood, the creativity, the courage to take on such a flagship operation and the opportunity to gain a vast knowledge and experience about constructing wooden garden buildings might outweigh the result of a possibly not 100% perfect product. Maybe you will find some inspiration from studying the online portfolios of professional manufacturers to get the right ideas for your dream of a wooden summer house.